Solder masks are layers of mataerial applied to circuitboards before soldering. The protect the conductive traces against oxidization and shorting out, but also help control the flow of solder when soldering the parts to the board. Solder masks are commonly silk-screened on to the etched circuit as a thin layer of coloured epoxy. 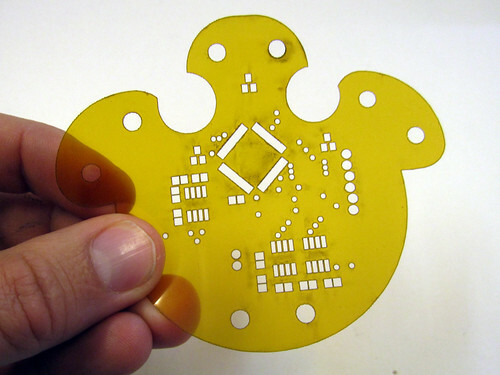 Solder masks can also be lasercut from kapton films that have a hot-melt adhesive layer so that they can be ironed-on or laminated to the circuit baord. Another readily available way of making a soldermask is to lasercut or vinycut one from more common materials. It is important that the materials can withstand the heat of soldering, and fusible interfacing (hot-melt adhesives) can be applied to almost any flat material. Silk is a fabric that can withstand high temperatures and it also feels and looks nice.